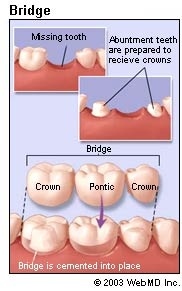 We will fit you with a temporary bridge while we wait for the lab to craft your permanent bridge. This will protect the abutments and the exposed gum areas and look more appealing than having a missing tooth. When the permanent bridge has been created, you will have a follow up visit to set the bridge. It will be placed on the abutments and Dr.Samaan will then use an adhesive to make sure that the bridge is set.